From the chaos in our families to the ruins of our central cities, America is a troubled nation. In The Spirit of Community, Dr. Amitai Etzioni explains why the critical institutions of our society are in crisis and shows what we can do to restore them. Dr. Etzioni believes that many of our problems can be traced to the broad range of individual rights many Americans feel they deserve. Tough issues arise when rights such as free speech or the right to privacy conflict with the needs of the community: Can we justify protecting society by restricting hate speech or protecting motorists by allowing the police to conduct random sobriety tests? Dr.Etzioni proposes a renewed and rebalanced social contract - one that both protects individual rights and serves and protects the needs of our society. He explains the sacrifices indivudals must make to insure the future of our society and shows why we must respect and nurture our families, provide for character education in our schools, and uphold shared moral values - for the larger good. 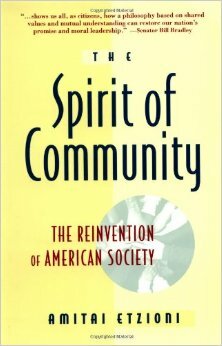 The Spirit of Community is a resounding call to action - a call to reinvent and reinvigorate our social and political institutions and restore our national sense of community.